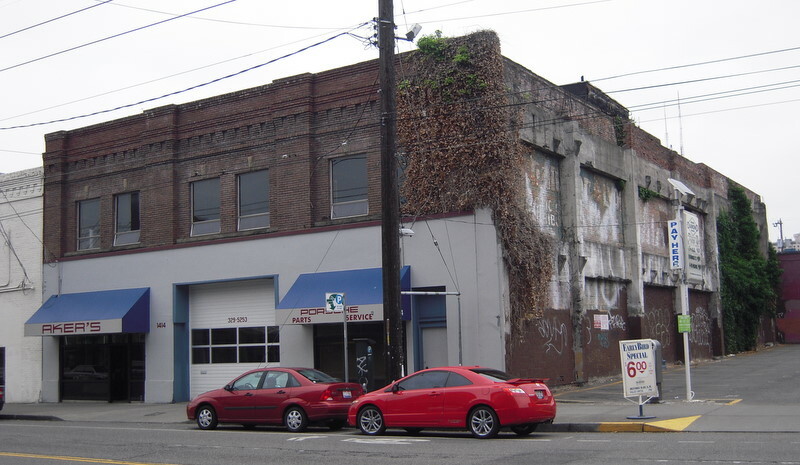 This 1912 building is in a group of similar garage buildings on Broadway at the south edge of Seattle's original Auto Row. In 1937 it was an auto wrecking company, and it remains an auto service garage. The Pike/Pine/Broadway vicinity became Seattle’s Auto Row shortly after the first automobile was offered for sale here in 1905. For the next twenty years virtually all local auto dealers and numerous auto-related businesses were located here. Nearly every building housed at least one dealership, service garage, parts dealer, paint shop or similar business. “Auto Row” thrived with the strong economy of the 1920s. However, the Great Depression of the 1930s led to general stagnation, and the neighborhood changed significantly after World War II. As the suburbs grew, most auto dealerships moved away from the congested city locations, although many parts dealers and service businesses remained. The 1980s brought new development, as people returned to live in city neighborhoods. Seattle Central Community College, the successor to Edison, demolished and replaced most of the old high school buildings. In the past ten years the Pike/Pine corridor has developed as a residential and entertainment center with numerous apartments and clubs, but numerous auto businesses like this one remain. This is rectangular two-story buildings of unreinforced masonry construction faced with brick (now painted green). It has newer aluminium window sash on the large display windows and the three paris of large windows on the second story. Between the two stories is a belt course of corbelled brick and each of the three window openings has corbelled brick along the top. The ground level has two garage doors and a modernized storefront. Williams, Jacqueline B. The Hill with a Future: Seattle's Capitol Hill 1900-1946. Seattle: CPK Ink, 2001.